Last week I had the chance to chat with Bruce Gates, one of the owners of Pearl Street Warehouse, the new music venue dedicated to Americana, folk, and blues at the District Wharf. Pearl Street serves as a link to DC's past as a hub of the Americana and bluegrass scene, while also appealing to a savvy, digital-first audience. This interview has been edited for length, clarity, and poor penmanship. 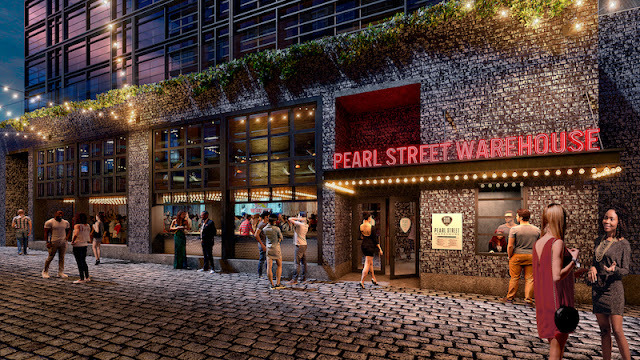 MMS: Would you characterize Pearl Street Warehouse (PSW) as a spiritual successor to venues like The Psyche Delly and The Red Fox Inn? BG: I came to DC at the latter end of the Cellar Door and Bayou era. It’s a small venue, maxed out standing-room only at 300, seated 150. It’s a very intimate space; it’s a space that really rocks. We’ve added something they didn’t have back then–hi-definition video. It’s a little bit like all of those places in a sense. MMS: How do you differentiate PSW from venues like The Birchmere, Rams Head On Stage, and The Hamilton Live, and how do you convince those in MD & VA to come in for a show? BG: We’re the smallest of all the venues. The intimacy factor will be a big differentiator. The quality of the food and bar setup will be solid. It’ll be a very comfortable place to eat, drink, and listen to music. The biggest differentiator is where we are–The Wharf. When everything is open, this will be a serious destination with a lot to do. It’s the waterfront, completely unchained at this point. MMS: Can you tell me a little bit about Warehouse Records? Do you have any plans to sign DC artists? BG: We're always open to signing an artist that makes sense for us. This is a labor of love. Warehouse Records got started because we were helping develop an artist. The industry has been in a bit of a transitional period, and we couldn’t get her signed. So we formed a label around her. I’d love to provide a 360 for an aspiring, local, talented artist. MMS: Do you envision PSW as a place that can help fill the void left by Iota’s closing? BG: Definitely. We have to acknowledge the role that Iota has played in the space for a very long time. It’s a sad time to see it going away, and we hope to pick up and operate at that level. The artists playing here will see that we’ve done our dead level best to provide a space that’s artist-friendly. We’re all too happy to step into that breach and provide a stream of opportunities. MMS: Can you tell me an artist you dream about booking? Is there any chance of an Emmylou Harris/Seldom Scene reunion at PSW? BG: Yes, that’s my answer to your question. That would be terrific. We’re open to anything at this point. One of the strategic values of having Booker T. Jones as an opener is knowing the influence he has in the community. We don’t have a fixed view of how everything is going to map out for the next 10-20 years. We have ideas and aspirations. We have some unique advantages here. We sit under two hotels. It’s easy in and out. We have this video capability that I don’t know anyone else has. We can hand the artist a thumb drive of their show at the end of the night. We can live stream it. It’s all about developing both the artist and the audience. In addition to the interview, I was lucky enough to attend a "Books and Booker" preview event last Wednesday. Happy hour kicked off at the newest member of the Politics & Prose family of bookstores, followed by a private Warehouse preview show with the legendary Booker T. Jones. MMS alum Town Mountain has already played PSW, with upcoming shows from Eli "Paperboy" Reed, Crescent City Americana outfit The Deslondes, former Be Good Tanyas bandmates Jolie Holland and Samantha Parton, and Drive By Truckers frontman Patterson Hood.